From space, the Earth looks like a small planet without borders, which emphasizes the need for those living on it to work together, according to Dr. Guion “Guy” Bluford Jr., the first African American in space. Bluford will speak at Southern Illinois University Edwardsville’s Arts & Issues presentation at 7:30 p.m. Monday, Feb. 19 in the Morris University Center’s Meridian Ballroom. “We all share this one planet. We all need to take care of it and manage its resources together, so we can all prosper,” said Bluford in his interview, Conversations from Penn State. Bluford was the first African American to receive NASA’s coveted Astronaut Pin and the U.S. Air Force’s Command Pilot Astronaut Wings. He was inducted into the International Space Hall of Fame in 1997 and the U.S. Astronaut Hall of Fame in 2010. Tickets can be purchased at artsandissues.com, by phone at 1-866-698-4253 or at the Morris University Center (MUC) Welcome Desk. The Arts & Issues series brings artistic excellence to the SIUE campus through an eclectic blend of speakers and performers. For more than 33 years, SIUE’s Arts & Issues series has highlighted some of the world’s finest artists. Each season, thought-provoking speakers inspire people of all ages and backgrounds. Thanks to the underwriting of SIUE, corporations, foundations and individual donors, tickets are often discounted as much as 50 percent. 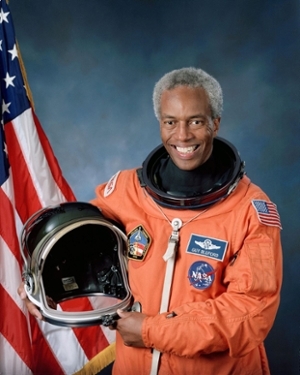 Dr. Guion “Guy” Bluford Jr. was the first African American in space.